And you have no idea where to paste the code then I hope the screenshots below will help you. If you are on a Mac see also the links on the bottom of this page. There are four types of modules and there are screenshots for the first two on this page. Here you store normal macros, User Defined Functions(UDFs) and global variables. Open the VBA editor with the shortcut Alt+F11. You see that you can use Ctrl+r to open the Project Explorer if you not see it. Normal the active project (workbook) is expand so you can see all the modules in it. But if you see this press the * on the numeric keyboard with the project selected to expand your project. You can also click on the + or double click the project name. If used, the Option Explicit statement must appear before any other code. When you use Option Explicit you must explicitly declare all variables. in code where the scope of the variable is not clear. Tools>Options in the menu bar and check "Require Variable Declaration". You must insert a module first in your project before you can use it for code. Click on Insert>Module with your project active in the Menu bar to do this. Select the module in the Project Explorer and press F7 or double click on the module. You can see above the menu bar if you have the code window of the correct module active. The module is directly active after you insert it in your project for the first time. 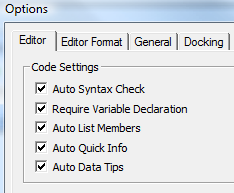 Paste the code in the code window on the right hand side below Option Explicit. After you paste the code in the code window use Alt+q to go back to Excel. In Excel you can use Alt+F8 then to select the macro and run it. Select the sheet in the Project Explorer and press F7 or double click on the sheet module. Another way to go to a sheet module is to right click on a sheet tab and choose "View Code"
You not have to open the VBA editor first when you use this. Select ThisWorkbook in the Project Explorer and press F7 or double click on the ThisWorkbook module. Note: if you are on a Mac you will find out that the VBE editor is not as good as the one in the Windows versions of Office. Below are two links with more information.